Composting within agricultural systems capitalizes upon the natural services of nutrient recycling in ecosystems. 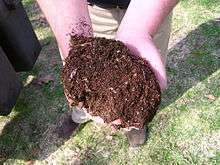 Bacteria, fungi, insects, earthworms, bugs, and other creatures dig and digest the compost into fertile soil. The minerals and nutrients in the soil is recycled back into the production of crops. A nutrient cycle (or ecological recycling) is the movement and exchange of organic and inorganic matter back into the production of living matter. The process is regulated by food web pathways that decompose matter into mineral nutrients. Nutrient cycles occur within ecosystems. Ecosystems are interconnected systems where matter and energy flows and is exchanged as organisms feed, digest, and migrate about. Minerals and nutrients accumulate in varied densities and uneven configurations across the planet. Ecosystems recycle locally, converting mineral nutrients into the production of biomass, and on a larger scale they participate in a global system of inputs and outputs where matter is exchanged and transported through a larger system of biogeochemical cycles. Particulate matter is recycled by biodiversity inhabiting the detritus in soils, water columns, and along particle surfaces (including 'aeolian dust'). Ecologists may refer to ecological recycling, organic recycling, biocycling, cycling, biogeochemical recycling, natural recycling, or just recycling in reference to the work of nature. Whereas the global biogeochemical cycles describe the natural movement and exchange of every kind of particulate matter through the living and non-living components of the Earth, nutrient cycling refers to the biodiversity within community food web systems that loop organic nutrients or water supplies back into production. The difference is a matter of scale and compartmentalization with nutrient cycles feeding into global biogeochemical cycles. Solar energy flows through ecosystems along unidirectional and noncyclic pathways, whereas the movement of mineral nutrients is cyclic. Mineral cycles include carbon cycle, sulfur cycle, nitrogen cycle, water cycle, phosphorus cycle, oxygen cycle, among others that continually recycle along with other mineral nutrients into productive ecological nutrition. Global biogeochemical cycles are the sum product of localized ecological recycling regulated by the action of food webs moving particulate matter from one living generation onto the next. Earths ecosystems have recycled mineral nutrients sustainably for billions of years. 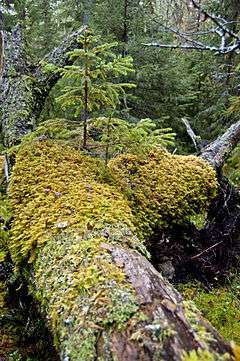 Fallen logs are critical components of the nutrient cycle in terrestrial forests. Nurse logs form habitats for other creatures that decompose the materials and recycle the nutrients back into production. A nutrient cycle of a typical terrestrial ecosystem. Ecosystems are capable of complete recycling. Complete recycling means that 100% of the waste material can be reconstituted indefinitely. This idea was captured by Howard T. Odum when he penned that "it is thoroughly demonstrated by ecological systems and geological systems that all the chemical elements and many organic substances can be accumulated by living systems from background crustal or oceanic concentrations without limit as to concentration so long as there is available solar or other source of potential energy":29 In 1979 Nicholas Georgescu-Roegen proposed a fourth law of entropy stating that complete recycling is impossible. Despite Georgescu-Roegen's extensive intellectual contributions to the science of ecological economics, the fourth law has been rejected in line with observations of ecological recycling. However, some authors state that complete recycling is impossible for technological waste. 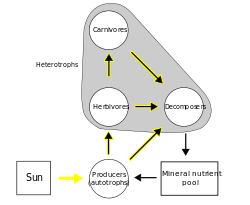 A simplified food web illustrating a three-trophic food chain (producers-herbivores-carnivores) linked to decomposers. The movement of mineral nutrients through the food chain, into the mineral nutrient pool, and back into the trophic system illustrates ecological recycling. The movement of energy, in contrast, is unidirectional and noncyclic. An example of ecological recycling occurs in the enzymatic digestion of cellulose. "Cellulose, one of the most abundant organic compounds on Earth, is the major polysaccharide in plants where it is part of the cell walls. Cellulose-degrading enzymes participate in the natural, ecological recycling of plant material." Different ecosystems can vary in their recycling rates of litter, which creates a complex feedback on factors such as the competitive dominance of certain plant species. Different rates and patterns of ecological recycling leaves a legacy of environmental effects with implications for the future evolution of ecosystems. An illustration of an earthworm casting taken from Charles Darwin's publication on the movement of organic matter in soils through the ecological activities of worms. The persistent legacy of environmental feedback that is left behind by or as an extension of the ecological actions of organisms is known as niche construction or ecosystem engineering. Many species leave an effect even after their death, such as coral skeletons or the extensive habitat modifications to a wetland by a beaver, whose components are recycled and re-used by descendants and other species living under a different selective regime through the feedback and agency of these legacy effects. Ecosystem engineers can influence nutrient cycling efficiency rates through their actions. Earthworms, for example, passively and mechanically alter the nature of soil environments. Bodies of dead worms passively contribute mineral nutrients to the soil. The worms also mechanically modify the physical structure of the soil as they crawl about (bioturbation), digest on the moulds of organic matter they pull from the soil litter. These activities transport nutrients into the mineral layers of soil. Worms discard wastes that create worm castings containing undigested materials where bacteria and other decomposers gain access to the nutrients. The earthworm is employed in this process and the production of the ecosystem depends on their capability to create feedback loops in the recycling process. Shellfish are also ecosystem engineers because they: 1) Filter suspended particles from the water column; 2) Remove excess nutrients from coastal bays through denitrification; 3) Serve as natural coastal buffers, absorbing wave energy and reducing erosion from boat wakes, sea level rise and storms; 4) Provide nursery habitat for fish that are valuable to coastal economies. Fungi contribute to nutrient cycling and nutritionally rearrange patches of ecosystem creating niches for other organisms. In that way fungi ingrowing dead wood allow xylophages to grow and develop and xylophages in turn affect dead wood, contributing to wood decomposition and nutrient cycling in the forest floor. The term ecological recycling appears in a 1968 publication on future applications of ecology for the creation of different modules designed for living in extreme environments, such as space or under sea: "For our basic requirement of recycling vital resources, the oceans provide much more frequent ecological recycling than the land area. Fish and other organic populations have higher growth rates, vegetation has less capricious weather problems for sea harvesting"
Water is also a nutrient. In this context, some authors also refer to precipitation recycling, which "is the contribution of evaporation within a region to precipitation in that same region." These variations on the theme of nutrient cycling continue to be used and all refer to processes that are part of the global biogeochemical cycles. However, authors tend to refer to natural, organic, ecological, or bio-recycling in reference to the work of nature, such as it is used in organic farming or ecological agricultural systems. An endless stream of technological waste accumulates in different spatial configurations across the planet and turns into a predator in our soils, our streams, and our oceans. This idea was similarly expressed in 1954 by ecologist Paul Sears: "We do not know whether to cherish the forest as a source of essential raw materials and other benefits or to remove it for the space it occupies. We expect a river to serve as both vein and artery carrying away waste but bringing usable material in the same channel. Nature long ago discarded the nonsense of carrying poisonous wastes and nutrients in the same vessels. ":960 Ecologists use population ecology to model contaminants as competitors or predators. Rachel Carson was an ecological pioneer in this area as her book Silent Spring inspired research into biomagification and brought to the worlds attention the unseen pollutants moving into the food chains of the planet. In contrast to the planets natural ecosystems, technology (or technoecosystems) is not reducing its impact on planetary resources. Only 7% of total plastic waste (adding up to millions upon millions of tons) is being recycled by industrial systems; the 93% that never makes it into the industrial recycling stream is presumably absorbed by natural recycling systems In contrast and over extensive lengths of time (billions of years) ecosystems have maintained a consistent balance with production roughly equaling respiratory consumption rates. The balanced recycling efficiency of nature means that production of decaying waste material has exceeded rates of recyclable consumption into food chains equal to the global stocks of fossilized fuels that escaped the chain of decomposition. Microplastics and nanosilver materials flowing and cycling through ecosystems from pollution and discarded technology are among a growing list of emerging ecological concerns. For example, unique assemblages of marine microbes have been found to digest plastic accumulating in the worlds oceans. Discarded technology is absorbed into soils and creates a new class of soils called technosols. Human wastes in the Anthropocene are creating new systems of ecological recycling, novel ecosystems that have to contend with the mercury cycle and other synthetic materials that are streaming into the biodegradation chain. Microorganisms have a significant role in the removal of synthetic organic compounds from the environment empowered by recycling mechanisms that have complex biodegradation pathways. The effect of synthetic materials, such as nanoparticles and microplastics, on ecological recycling systems is listed as one of the major concerns for ecosystem in this century. ↑ Montes, F.; Cañellas, I. (2006). "Modelling coarse woody debris dynamics in even-aged Scots pine forests". Forest Ecology and Management. 221 (1-3): 220–232. doi:10.1016/j.foreco.2005.10.019. ↑ Ohkuma, M. "Termite symbiotic systems: Efficient bio-recycling of lignocellulose.". Applied microbiology and biotechnology. 61 (1): 1–9. doi:10.1007/s00253-002-1189-z. ↑ Elser, J. J.; Urabe, J. (1999). "The stoichiometry of consumer-driven nutrient recycling: Theory, observations, and consequences." (PDF). Ecology. 80 (3): 735–751. doi:10.1890/0012-9658(1999)080[0735:TSOCDN]2.0.CO;2. ↑ Doran, J. W.; Zeiss, M. R. (2000). "Soil health and sustainability: Managing the biotic component of soil quality." (PDF). Applied Soil Ecology. 15 (1): 3–11. doi:10.1016/S0929-1393(00)00067-6. ↑ Lavelle, P.; Dugdale, R.; Scholes, R.; Berhe, A. A.; Carpenter, E.; Codispoti, L.; et al. (2005). "12. Nutrient cycling". Millennium Ecosystem Assessment: Objectives, Focus, and Approach (PDF). Island Press. ISBN 1-55963-228-3. ↑ Levin, Simon A; Carpenter, Stephen R; Godfray, Charles J; Kinzig, Ann P; Loreau, Michel; Losos, Jonathan B; Walker, Brian; Wilcove, David S (27 July 2009). The Princeton Guide to Ecology. Princeton University Press. p. 330. ISBN 0-691-12839-1. 1 2 3 Bormann, F. H.; Likens, G. E. (1967). "Nutrient cycling" (PDF). Science. 155 (3761): 424–429. Bibcode:1967Sci...155..424B. doi:10.1126/science.155.3761.424. ↑ Brown, M. T.; Buranakarn, V. (2003). "Emergy indices and ratios for sustainable material cycles and recycle options" (PDF). Resources, Conservation and Recycling. 38 (1): 1–22. doi:10.1016/S0921-3449(02)00093-9. ↑ Odum, H. T. (1991). "Energy and biogeochemical cycles". In Rossi, C.; T., E. Ecological physical chemistry. Amsterdam: Elsevier. pp. 25–26. ↑ Cleveland, C. J.; Ruth, M. (1997). "When, where, and by how much do biophysical limits constrain the economic process? : A survey of Nicholas Georgescu-Roegen's contribution to ecological economics" (PDF). Ecological Economics. 22 (3): 203–223. doi:10.1016/S0921-8009(97)00079-7. ↑ Ayres, R. U. (1998). "Eco-thermodynamics: Economics and the second law". Ecological Economics. 26 (2): 189–209. doi:10.1016/S0921-8009(97)00101-8. 1 2 Huesemann, M. H. (2003). "The limits of technological solutions to sustainable development" (PDF). Clean Techn Environ Policy. 5: 21–34. doi:10.1007/s10098-002-0173-8. ↑ Kormondy, E. J. (1996). Concepts of ecology (4th ed.). New Jersey: Prentice-Hall. p. 559. ISBN 0-13-478116-3. ↑ Proulx, S. R.; Promislow, D. E. L.; Phillips, P. C. (2005). "Network thinking in ecology and evolution" (PDF). Trends in Ecology and Evolution. 20 (6): 345–353. doi:10.1016/j.tree.2005.04.004. PMID 16701391. ↑ Smaling, E.; Oenema, O.; Fresco, L., eds. (1999). "Nutrient cycling in ecosystems versus nutrient budgets in agricultural systems". Nutrient cycles and nutrient budgets in global agro-ecosystems (PDF). Wallingford, UK: CAB International. pp. 1–26. ↑ Roughgarden, J.; May, R. M.; Levin, S. A. (eds.). "13. Food webs and community structure". Perspectives in ecological theory. Princeton University Press. pp. 181–202. ISBN 0-691-08508-0. ↑ Legendre, L.; Levre, J. (1995). "Microbial food webs and the export of biogenic carbon in oceans" (PDF). Aquatic Microbial Ecology. 9: 69–77. doi:10.3354/ame009069. ↑ Ulanowicz, R. E. (1983). "Identifying the structure of cycling in ecosystems" (PDF). Mathematica Biosciences. 65: 219–237. doi:10.1016/0025-5564(83)90063-9. ↑ Rouvinen, J.; Bergfors, T.; Teeri, T.; Knowles, J. K. C.; Jones, T. A. (1990). "Three-dimensional structure of cellobiohydrolase II from Trichoderma reesei". Science. 249 (4967): 380–386. Bibcode:1990Sci...249..380R. doi:10.1126/science.2377893. JSTOR 2874802. PMID 2377893. ↑ Clark, B. R.; Hartley, S. E.; Suding, K. N.; de Mazancourt, C. (2005). "The effect of recycling on plant competitive hierarchies". The American Naturalist. 165 (6): 609–622. doi:10.1086/430074. JSTOR 3473513. ↑ Stockdale, E. A.; Shepherd, M. A.; Fortune, S.; Cuttle, S. P. (2006). "Soil fertility in organic farming systems – fundamentally different?". Soil Use and Management. 18 (S1): 301–308. doi:10.1111/j.1475-2743.2002.tb00272.x. ↑ Macfadyen, S.; Gibson, R.; Polaszek, A.; Morris, R. J.; Craze, P. G.; Planque, R.; et al. (2009). "Do differences in food web structure between organic and conventional farms affect the ecosystem service of pest control?". Ecology Letters. 12: 229–238. doi:10.1111/j.1461-0248.2008.01279.x. ↑ Altieri, M. A. (1999). "The ecological role of biodiversity in agroecosystems" (PDF). 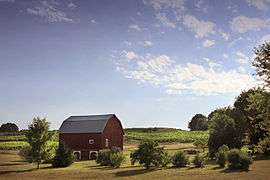 Agriculture, Ecosystems and Environment. 74 (1-3): 19–31. doi:10.1016/S0167-8809(99)00028-6. ↑ Mäder, P. "Sustainability of organic and integrated farming (DOK trial)". In Rämert, B.; Salomonsson, L.; Mäder, P. Ecosystem services as a tool for production improvement in organic farming – the role and impact of biodiversity (PDF). Uppsala: Centre for Sustainable Agriculture, Swedish University of Agricultural Sciences. pp. 34–35. ISBN 91-576-6881-7. 1 2 Larsson, M.; Granstedt, A. (2010). "Sustainable governance of the agriculture and the Baltic Sea: Agricultural reforms, food production and curbed eutrophication.". Ecological Economics. 69 (10): 1943–1951. doi:10.1016/j.ecolecon.2010.05.003. ↑ Darwin, C. R. (1881). "The formation of vegetable mould, through the action of worms, with observations on their habits.". London: John Murray. ↑ Laland, K.; Sterelny, K. (2006). "Perspective: Several reasons (not) to neglect niche construction" (PDF). Evolution. 60 (9): 1751–1762. doi:10.1111/j.0014-3820.2006.tb00520.x. ↑ Hastings, A.; Byers, J. E.; Crooks, J. A.; Cuddington, K.; Jones, C. G.; Lambrinos, J. G.; et al. (February 2007). "Ecosystem engineering in space and time". Ecology Letters. 10 (2): 153–164. doi:10.1111/j.1461-0248.2006.00997.x. PMID 17257103. ↑ Barot, S.; Ugolini, A.; Brikci, F. B. (2007). "Nutrient cycling efﬁciency explains the long-term effect of ecosystem engineers on primary production" (PDF). Functional Ecology. 21: 1–10. doi:10.1111/j.1365-2435.2006.01225.x. ↑ Yadava, A.; Garg, V. K. (2011). "Recycling of organic wastes by employing Eisenia fetida". Bioresource Technology. 102 (3): 2874–2880. doi:10.1016/j.biortech.2010.10.083. ↑ The Nature Conservancy. "Oceans and Coasts Shellfish Reefs at Risk: Critical Marine Habitats". ↑ Boddy, Lynne; Watkinson, Sarah C. (1995-12-31). "Wood decomposition, higher fungi, and their role in nutrient redistribution". Canadian Journal of Botany. 73 (S1): 1377–1383. doi:10.1139/b95-400. ISSN 0008-4026. ↑ Filipiak, Michał; Weiner, January (2016-09-01). "Nutritional dynamics during the development of xylophagous beetles related to changes in the stoichiometry of 11 elements". Physiological Entomology: n/a–n/a. doi:10.1111/phen.12168. ISSN 1365-3032. ↑ Gorham, E. (1991). "Biogeochemistry: Its origins and development" (PDF). Biogeochemistry. 13 (3): 199–239. doi:10.1007/BF00002942. ↑ Springer on behalf of Royal Botanic Gardens, Kew (1898). "The advances made in agricultural chemistry during the last twenty-five years". Bulletin of Miscellaneous Information (Royal Gardens, Kew). 1898 (144): 326–331. JSTOR 4120250. ↑ Penston, N. L. (1935). "Studies of the physiological importance of the mineral elements in plants VIII. The variation in potassium content of potato leaves during the day". New Phytologist. 34 (4): 296–309. doi:10.1111/j.1469-8137.1935.tb06848.x. JSTOR 2428425. ↑ Kahl, M. P. (1964). "Food ecology of the wood stork (Mycteria americana) in Florida". Ecological Monigraphs. 34 (2): 97–117. JSTOR 1948449. ↑ Slack, K. V.; Feltz, H. R. (1968). "Tree leaf control on low flow water quality in a small Virginia stream". Environ. Sci. Technol. 2 (2): 126–131. Bibcode:1968EnST....2..126S. doi:10.1021/es60014a005. ↑ McHale, J. (1968). "Toward the future". Design Quarterly. 72: 3–31. JSTOR 4047350. ↑ Nissenbaum, A. "Scavenging of soluble organic matter from the prebiotic oceans". Origins of Life and Evolution of Biospheres. 7 (4): 413–416. Bibcode:1976OrLi....7..413N. doi:10.1007/BF00927936. ↑ Martina, M. M.; Hoff, M. V. (1988). "The cause of reduced growth of Manduca sexta larvae on a low-water diet: Increased metabolic processing costs or nutrient limitation?". Journal of Insect Physiology. 34 (6): 515–525. doi:10.1016/0022-1910(88)90193-X. ↑ Eltahir, E. A. B.; Bras, R. L. (1994). "Precipitation recycling in the Amazon basin" (PDF). Q. J . R . Meteorof. SOC. 120: 861–880. Bibcode:1994QJRMS.120..861E. doi:10.1002/qj.49712051806. ↑ Derraik, J. G. B. (2002). "The pollution of the marine environment by plastic debris: A review". Marine Pollution Bulletin. 44: 842–852. doi:10.1016/s0025-326x(02)00220-5. ↑ Thompson, R. C.; Moore, C. J.; vom Saal, F. S.; Swan, S. H. (2009). "Plastics, the environment and human health: current consensus and future trends" (PDF). Phil. Trans. R. Soc. B. 364 (1526): 2153–2166. doi:10.1098/rstb.2009.0053. ↑ Sears, P. B. (1954). "Human ecology: A problem in synthesis". Science. 120 (3128): 959–963. Bibcode:1954Sci...120..959S. doi:10.1126/science.120.3128.959. JSTOR 1681410. PMID 13216198. ↑ Rohr, J. R.; Kerby, J. L.; Sih, A. (2006). "Community ecology as a framework for predicting contaminant effects" (PDF). Trends in Ecology & Evolution. 21 (11): 606–613. doi:10.1016/j.tree.2006.07.002. ↑ Gray, J. S. (2002). 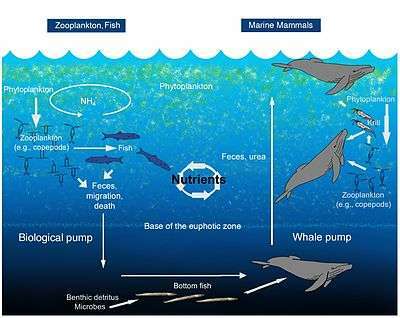 "Biomagnification in marine systems: the perspective of an ecologist" (PDF). Marine Pollution Bulletin. 45 (1-12): 46–52. doi:10.1016/S0025-326X(01)00323-X. ↑ Huesemann, M. H. (2004). The failure of eco-efficiency to guarantee sustainability: Future challenges for industrial ecology. Environmental Progress, 23(4), 264-270. ↑ Huesemann, M. H. & Huesemann, J. A. (2008). Will progress in science and technology avert or accelerate global collapse? A critical analysis and policy recommendations. Environment, Development and Sustainability, 10(6), 787-825. ↑ Siddique, R., Khatib, J., & Kaur, I. (2008). Use of recycled plastic in concrete: A review. Waste Management, 28(10), 1835-1852. 1 2 Odum, E. P.; Barrett, G. W. (2005). Fundamentals of ecology. Brooks Cole. p. 598. ISBN 978-0-534-42066-6. ↑ Luke, T. W. (1995). "On environmentality: Geo-Power and eco-knowledge in the discourses of contemporary environmentalism". The Politics of Systems and Environments, Part II. 31: 57–81. JSTOR 1354445. 1 2 Sutherland, W. J.; Clout, M.; Côte, I. M.; Daszak, P.; Depledge, M. H.; Fellman, L.; et al. (2010). "A horizon scan of global conservation issues for 2010" (PDF). Trends in Ecology and Evolution. 25 (1): 1–7. doi:10.1016/j.tree.2009.10.003. ↑ Rossiter, D. G. "Classification of Urban and Industrial Soils in the World Reference Base for Soil Resources (5 pp)" (PDF). Journal of Soils and Sediments. 7 (2): 96–100. doi:10.1065/jss2007.02.208. ↑ Meybeck, M. (2003). "Global analysis of river systems: from Earth system controls to Anthropocene syndromes" (PDF). Phil. Trans. R. Soc. Lond. B. 358 (1440): 1935–1955. doi:10.1098/rstb.2003.1379. ↑ Bosma, T. N. P.; Harms, H.; Zehnder, A. J. B. (2001). "Biodegradation of Xenobiotics in Environment and Technosphere". The Handbook of Environmental Chemistry. 2K. pp. 163–202. doi:10.1007/10508767_2. ↑ Rees, W. E. (2009). "The ecological crisis and self-delusion: implications for the building sector". Building Research & Information. 37 (3): 300–311. doi:10.1080/09613210902781470. ↑ Pomeroy, L. R. "The strategy of mineral cycling.". Annual Review of Ecology and Systematics. 1: 171–190. doi:10.1146/annurev.es.01.110170.001131. JSTOR 2096770. ↑ Romero, J.; Lee, K.; Pérez, M.; Mateo, M. A.; Alcoverro, T. "9. Nutrient dynamics in seagrass ecosystems.". In Larkum, A. W. D.; Orth, R. J.; Duarte, C. M. Seagrasses: Biology, Ecology and Conservation. pp. 227–270.